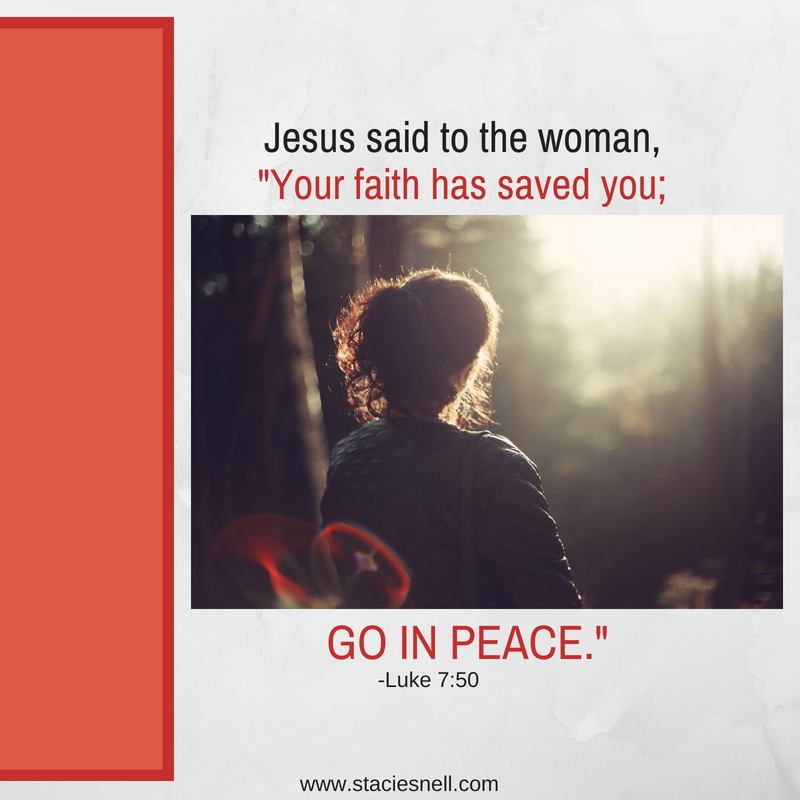 Two times in the book of Luke, Jesus gives the command to GO IN PEACE. Both times the command was given to a woman. Let’s consider the lack of peace both of these women must have been dealing with. The first woman was likely haunted by guilt and shame. Maybe she found it impossible to escape her sins. Even when she sought after Jesus and the forgiveness from sins she had heard about, she was met with judgmental stares and snarky comments. I’d imagine she constantly walked around with her head hung in shame and an overwhelming feeling of unworthiness. As for the second woman, imagine the lack of peace you would feel as you bled continuously year after year. If you have ever dealt with any form of chronic health issues, you know how it steals your peace. You are consumed with thoughts of how you are ever going to overcome it; fearing the future and constantly fighting the feeling of defeat. Both of these women experienced Jesus in such a way that their faith radically changed them. The result–the ability to move forward in peace. Peace of mind and soul was theirs through their faith in Jesus. “Peace that surpasses all understanding” would guard their hearts and minds against guilt, shame, unworthiness, worry, pain, anxiety, despair and defeat. (See Philippians 4:7) . But in order to take hold of that peace, both of these women had to move forward in faith, truly believing what Jesus had done for them. The sinful woman had to truly believe that her sins were forgiven. Then, and only then, would she be able to mute the opinions of Simon the Pharisee and others who would judge her for her past. The woman who bled would have to truly believe that healing was hers. She couldn’t move forward constantly questioning if she was really healed or if the issue would return. Faith in Jesus brings peace of mind and soul. You just have to believe it. Believe Him! Believe that He is who He says He is, and you are who He says you are!